Celebration Asian Paper Lanterns. 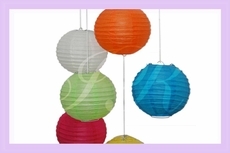 Easy to setup, come with detail instructions inside the lanterns and with 9 different colors and 2 most popular sizes 8 inches and 14 inches. Wholesale and warehouse prices to all. You save up to 67%. Fact: Paper lanterns, especially red lanterns, were created to celebrate important days, like Chinese New Year, but also to light the interior and exterior of modern homes. 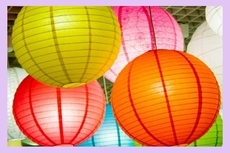 Each lantern signified beautiful and serene signs of good fortune and plenty of future celebrations. So, Deng Hui, 灯会,(means Lantern Show in Chinese) was often a routine to be used during Chinese or Japanese traditional eminent parties or grand events like the New Year, Jan 15, the Chinese Valentine's Day. It is still found and use now in many civilizations in Asia, and now even more wide-spread by people from Asia moving to different continents spreading their cultural customs, and here in US and Europe. 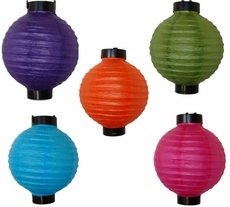 As of small lantern decorations, it is considered a romantic and elegant addition for any type of classical event. This decorative item can be found practically anywhere, from neighborhood stores to arts & crafts stores where they might be hanging from the ceiling. Click the following sizes to see detail now. Buy it now save up to 67%.